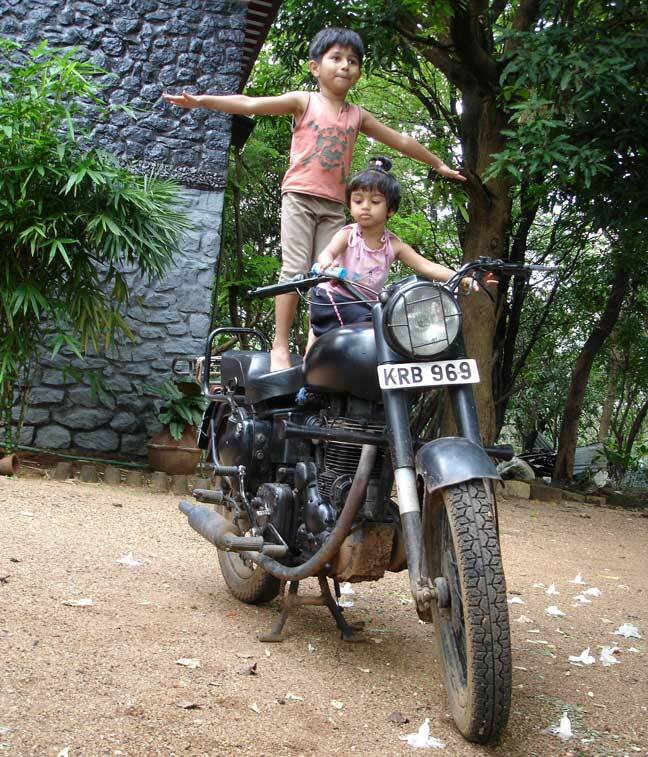 The two adorable children perched atop a time worn Royal Enfield Bullet motorcycle are Hrishi and Meenakshi, nephew and niece of Ranjith Anand. Ranjith is the reader who brought our attention to the sentimental story of an old Royal Enfield Bullet motorcycle imported from India to Canada by S. Balakrishnan of Winnipeg. Balakrishnan had helped his father restore the bike, in India, and now his son wanted him to bring "grandpa's motorcycle" to their home in Canada. 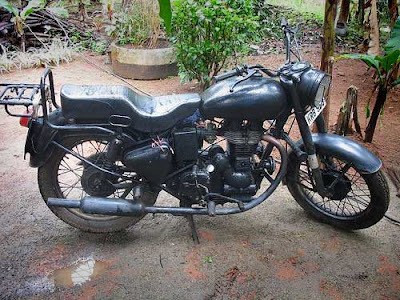 After the I recounted the story, from The Hindu, Ranjith mentioned that he, too, has an attachment to a vintage Royal Enfield left behind in India. He is a Ph.D. student at Tufts University in the United Sates. "Wish I could do the same as what Balakrishnan did!" 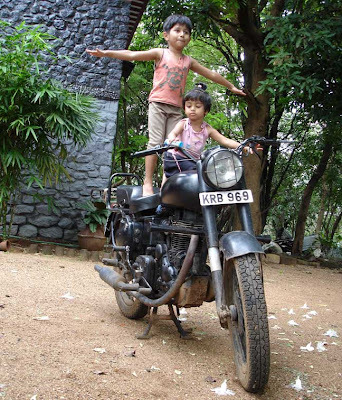 Ranjith sent the picture of Hrishi and Meenakshi, who look as though they are impersonating one of the big Indian Army stunt shows. These feature mounted troopers balancing on Bullets and riding through rings of fire. The children look brave enough to try it. Ranjith also sent a picture of the motorcycle by itself. "We call it Rakshasan, meaning Demon/Monster," he wrote. "My dad had gifted a Bullet to my brother (as he had promised) when he secured admission into the prestigious Indian Institute of Science. Later, my brother promised that he will pass the bike on to me, if I get into a good program, which was what motivated me to get into a Masters Program!" Ranjith sent one last photo, of himself and his wife riding the Monster. "My wife's name is Mala," Ranjith writes. "I am from Kerala and she is from Hyderabad. We met here in Boston; actually at Tufts." I saw this blog just now. Cool man! I recognize ur home in the background as well. Hope you got your mundu stainless after the ride.